For a long time the ferry was the only way to cross the fjords, now they are gradually replaced by bridges and tunnels. The road network in Norway is developing very intensively, despite the fact that transport on the roads is not as much as, for example, in Central Europe. 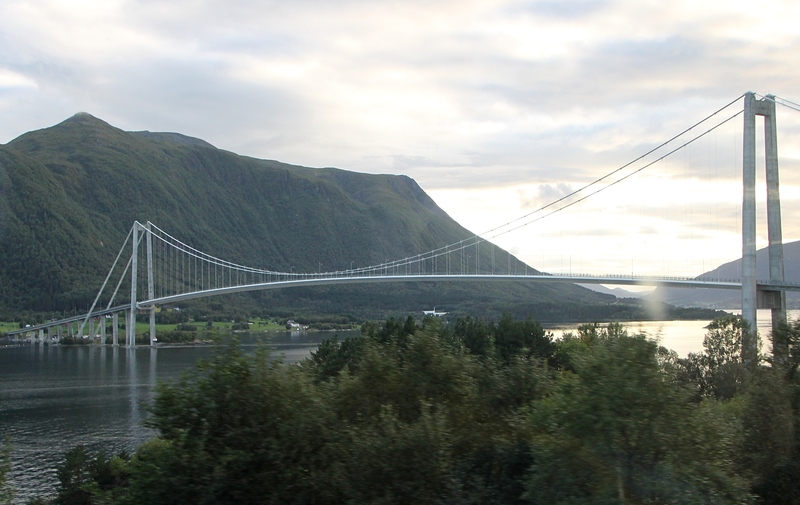 Through two dozen kilometers to the West from Kanestraum the E39 highway crosses the Gjemnessund bridge (Gjemnessund) one of the most elegant bridges of Norway. The road goes along the shore, so you can see the bridge in all its glory against the backdrop of no less picturesque mountains. Gjemnessund suspension bridge (Gjemnessundbrua) was opened in 1992 and until 2013 remained the longest in Norway. The length of the bridge is 1257 meters, the main span is 623 meters, and the height above the water is 43 meters. Pylons of the bridge rise to a height of 108 meters from the water level.